Setting up time-heterogeneous epoch substitution models in BEAST. This tutorial describes how to extend BEAST XML files, such as generated by BEAUti, to include analyses under time-heterogeneous (epoch) models (see Bielejec et al., 2014). In this tutorial we will show how to setup, run and analyse data with the epoch models described in Bielejec et al. (2014). We present an artificial example and describe the necessary steps to get an actual analysis up and running. Example files for this tutorial can be found here. This tutorial assumes that the user has a basic knowledge of the BEAST framework, knows how to generate an XML input file and can interpret basic output information of an MCMC run. BEAST runnables for all major platforms can be found here. You will need a Java runtime environment version 1.5 or greater to run the BEAST executable. Due to the computational intensity of the computations involved in the epoch model, the BEAGLE library also needs to be installed and used with the BEAST runs discussed here. See the BEAGLE website for details on how to install and use the BEAGLE library. Start by uploading your sequences into BEAUTi and generating a standard XML file. For simplicity we assume a single nucleotide partition in this example, a constant population size model and a strict molecular clock. The data in this tutorial was artificially generated by evolving it on an MCC tree generated from a Bayesian phylogenetic analysis of human influenza A hemagglutinin gene sequences sampled through different epidemic seasons (Drummond and Suchard, 2010). This tree is visualised in Figure 1. We will analyze the data with the HKY nucleotide substitution model (Hasegawa et al., 1985), focusing on estimating the κ parameter (i.e., the transition-transversion bias) in three separate epochs. Figure 1: Tree topology for time-heterogeneous analysis. The first epoch lasts until transition time T1 set at 7 (i.e. 7 years before the most recent sampling date) and is governed by a model which we will call HKY1. The second epoch lies between transition times T1 and T2 = 15, with substitution model HKY2. Finally, everything past T2 occurs in a third epoch, with corresponding model HKY3. We are done with editing the XML and can proceed to performing the analysis. Epoch model inference requires the BEAGLE library installed and configured to be visible for BEAST. Installation and setup of the BEAGLE library on various platforms is covered on this website. After the analysis has finished you can import the resulting log file into the software of your choice, e.g. Tracer (a program for analysing the trace files generated by MCMC runs. Figure 2 presents the posterior probability distributions of the κ parameters, which were our main interest in this analysis. 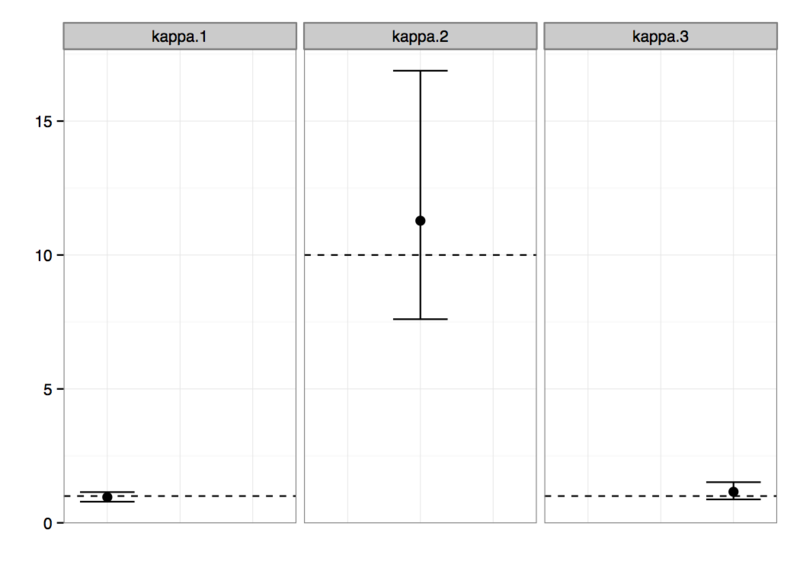 We can clearly see non-overlapping regions, suggesting that the parameters κ1 and κ3 are significantly different from the parameter κ2. There is probably no difference between the parameters of the first and the third epoch. Figure 2: 95% credibility intervals for the κ parameters. Horizontal lines mark the true value, black dots indicate posterior mean values. F. Bielejec, P. Lemey, G. Baele, A. Rambaut, and M. A. Suchard (2014)) Inferring heterogeneous evolutionary processes through time: from sequence substitution to phylogeography. Syst. Biol. 63(4):493–504. A. Drummond and M. Suchard (2010) Bayesian random local clocks, or one rate to rule them all. BMC Biology, 8(1):114. M. Hasegawa, H. Kishino, and T. Yano (1985) Dating of the human-ape splitting by a molecular clock of mitochondrial DNA. J. Mol. Evol. 22:160–174.